Harry is a lovely little boy with severe brachycephaly, a type of flat head syndrome. The condition is characterised by a flattened area at the back of the head, which causes its width to be disproportionate to its length. Harry’s mum began to realise that Harry’s head was becoming flat at around six weeks and raised her concerns with his health visitor. She was advised to reposition but this failed to improve Harry’s head shape and she grew increasingly concerned over the weeks and months that followed. When Harry was six months old, she took him to her GP, who referred him to a consultant at Addenbrooke’s Hospital. 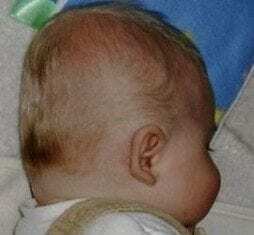 Harry had a CT scan to rule out craniosynostosis (the early fusion of the bones in the head), but his parents were told that there was no more the NHS could do to correct his head shape. While the consultant agreed that Harry would benefit from a helmet, he admitted that the NHS would be unable to fund it. By chance, Harry’s mum came across children’s charity Tree of Hope whilst reading an article about a baby who had received funding for a helmet. The application process was very simple and quick, and within six days they received some excellent news: the charity would pay for Harry’s treatment in full. Harry’s parents had seen Technology in Motion on Channel 4’s Embarrassing Bodies and read lots of positive feedback on internet forums, and they booked an appointment with us straight away. At the assessment Harry’s head was measured and scanned and his cranial ratio (the relationship between the width and length of his head) was found to be 105 percent. This is regarded as very severe, as a normal cranial ratio sits between 78 percent and 83 percent. Harry’s mum was delighted with the clinician and his clear explanation of the process involved. She also noted how relaxed the assessment was – apparently Harry was so unfazed by the whole process that he was able to have lunch whilst being scanned! If you are concerned about your child’s head shape, call 0330 100 1800 or fill in our contact form to book a free appointment at your nearest clinic and we’ll advise you on the best possible course of action.